Police threaten to arrest “earthquake sightseers”, as an ambulance man recounts his shocking experiences to New Zealand radio. WITH 98 PEOPLE dead and more than 226 still missing, rescuers fear they may not pull any more survivors from the rubble of the earthquake that devastated the New Zealand city of Christchurch on Tuesday. At least 120 bodies may be lying trapped in the tangled concrete and steel that was the Canterbury Television – or CTV – building. Many of them may be students from Japan, Thailand and China, who were buried when an English language school collapsed. Christchurch police superintendent Russell Gibson said the operation had become one of body recovery, though he said rescuers have not abandoned hope. He said that while the number of missing was “significantly more” than 300, the fact that they had not answered the phones did not mean they were dead. 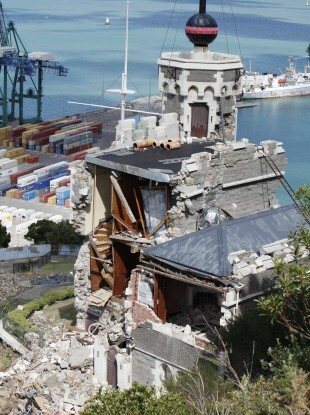 The mood in Christchurch is growing increasingly tense as police were forced to threaten to arrest “earthquake sightseers”, amidst fears that more buildings may collapse, the NZ Herald reported. Do people understand what has happened here? Any aftershock could bring down these damaged buildings and they want to walk around here. We don’t have time to babysit everyone. The Grand Chancellor Hotel, which is the tallest in Christchurch, is one of the buildings reported to be on the verge of collapse. Email “Hopes of finding survivors fade, as NZ ambulanceman recounts his shocking experiences (Audio, Video)”. Feedback on “Hopes of finding survivors fade, as NZ ambulanceman recounts his shocking experiences (Audio, Video)”.